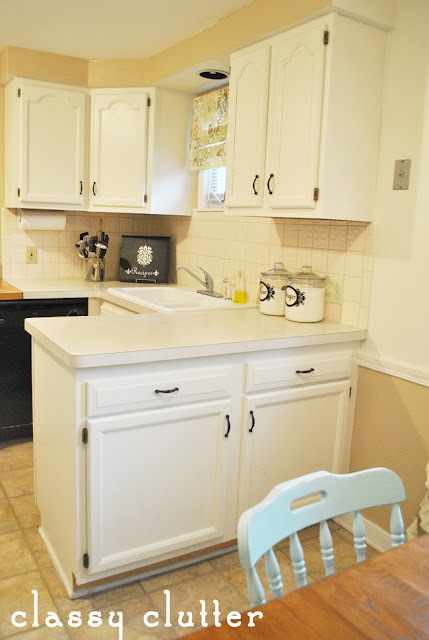 The cabinets were sanded, primed and painted Behr’s Swiss Coffee. 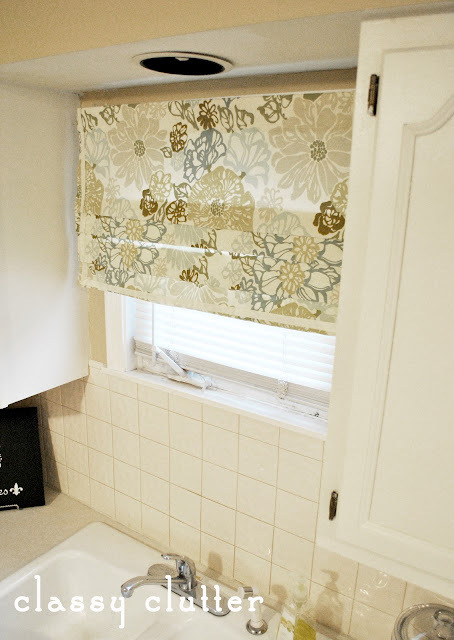 I made the faux roman shade for above the sink to match the dining room chairs. My friend gave me the fabric when I helped her make new curtains for her kitchen. I knew her old fabric would work perfectly! 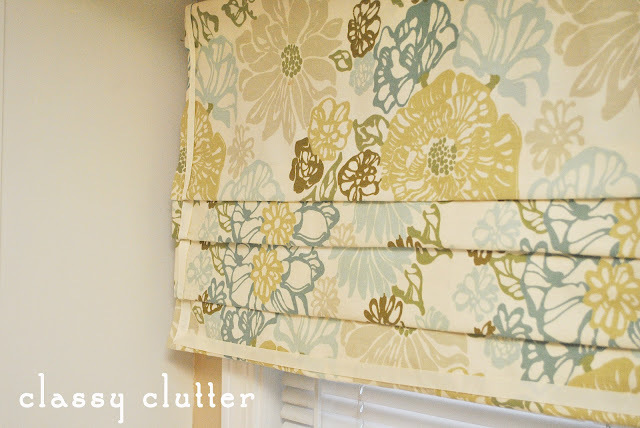 I used this tutorial and added the ribbon for trim and hung it right up. I really love how it turned out. Here’s an up close shot of the cabinets. I used Krylon’s Oil Rubbed Bronze for the hardware. To find out how to paint hardware the right way, check out my tutorial here. The best part is, my landlord loves it! I was super nervous about tackling such a big project when it’s not my house! But I love it and she loves it! Win win! What do you think? Don’t you think the white makes it brighter!? The whole room feels bigger to me! Holy cow!!! It looks amazing! I can’t believe the difference it makes! It looks like a completely different house! I love it! 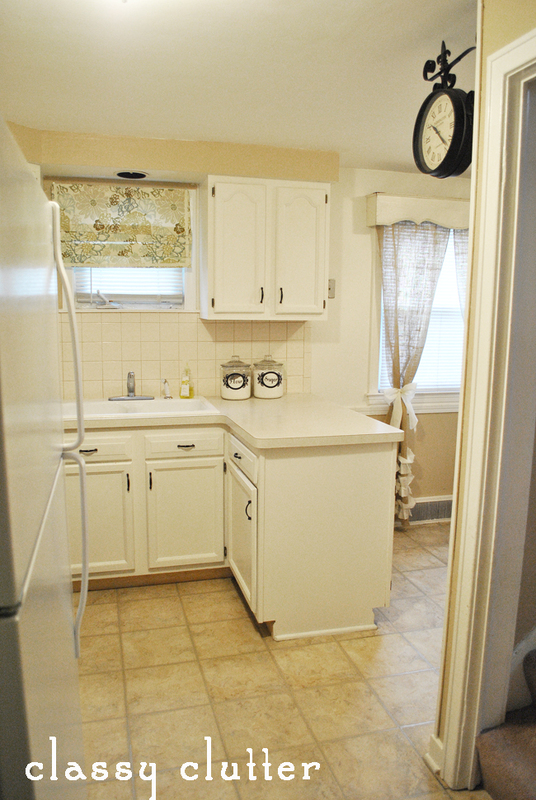 I wish our landlord would let us paint the cabinets – they look the same as your before pic. Wonderful job! Looks great Mallory! So fresh and bright…I love white cabinets too! they look so light and bright! great job! i love teh splashes of blue in there and those fun curtains, too! Oh my it looks lovely! Reading that it took 6 months makes me not feel so bad about how long it’s taking to do my kitchen! And… your burlap curtains are darling! Love them! Simply beautiful! Love the white cabinets. one more time for the record I LOVE IT!!! love our bright & clean everything is! Great Job! Your kitchen looks FAB! 🙂 I especially love the window treatments! 🙂 SO VERY CUTE! Love the ruffles!!! Cute! I have a question about your extra cabinet to the right of your sink. Do you feel cramped working in that little nook? Ivebeen thinking of adding a section like that because I don’t have much countertop space, but my daughter keeps telling me that it will make it too cramped. Wow, what a difference. It looks so fresh and clean! I saw your link at the power of paint party. I really love posts that prove that you can redo a room affordably and make it look like you spent a pretty penny on it! The paint and accessories make the room look amazing and bring everything you didn’t redo look like you purposefully picked them out yourself (ie. the backsplash, countertop). Thanks so much for sharing this inspiring project! You kitchen transformation is a work of art. What a big change. I wouldn’t even want to cook in there cuz it’s so pretty. ( you’re probably thinking that girl would use any excuse not to cook ) True, but it really is a big improvement! Good Job! I am your newest follower! Wow! Beautiful transformation! My kitchen cabinets, all the trim , and the doors in our house are painted with The swiss Coffee. I love it! Looks AMAZING!! I love what a can of white paint can do! So fun!! Love your kitchen makeover!! It’s so bright & cheery now! Great job! That turned out absolutely amazing. What a great kitchen makeover. It makes the room look so much brighter and larger! You did a GREAT job! Gorgeous transformation! 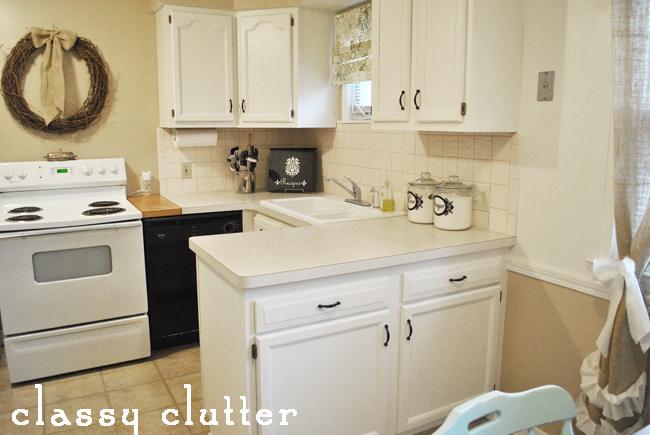 I’m putting your kitchen in the PoPP Spotlight @ Domestically Speaking. Thanks for linking up. That is the cutest, tiniest kitchen ever! Just adorable. I love the roman shade! Awesome job! I love everything about it! 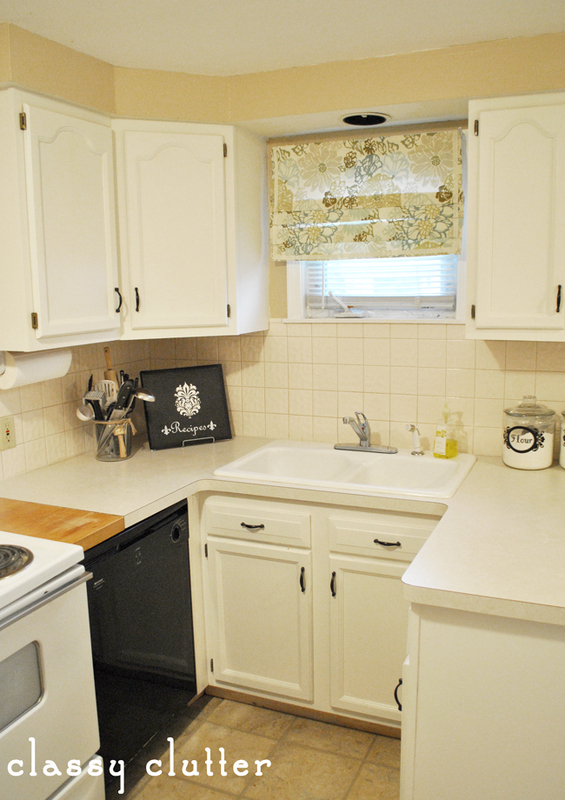 Our kitchens are twins (well, your old kitchen and my current kitchen)! Our walls are painted that exact shade of green, and we have honey oak cabinets. 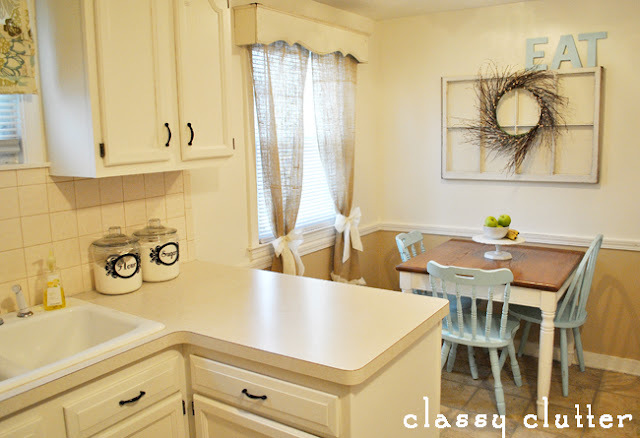 Redoing our kitchen (painting the walls and cabinets) is on our spring/summer project list. Great to see another tiny kitchen transformed! We had our cabinets painted and it made such a huge difference in the space. Beautiful work! Looks fabulous! So spacious and bright, good job! I love EVERYTHING about this redo. Wonderful job, looks absolutely fantastic. I came here from Better After because I wanted to see the rest of your photos! I adore this makeover! Very inspiring. I have a question-where did you move your microwave? Our microwave is on our counter and I hate it. I noticed yours is not on the counter in the after photos. Love it! I’m so inspired. I’ve been waiting for just the right idea for my incredibly ugly kitchen redo, and I think this is it! I will have to figure out something for my blue laminate counter tops, but I think I can paint those as well. Thanks for helping me envision what my kitchen can be. Wow, talk about the little kitchen that could! Nicely done. It looks amazing! What a difference! Beautiful re-do. Can i ask what the fabric is. I love it! It looks waaaaay better with the white! I love it. 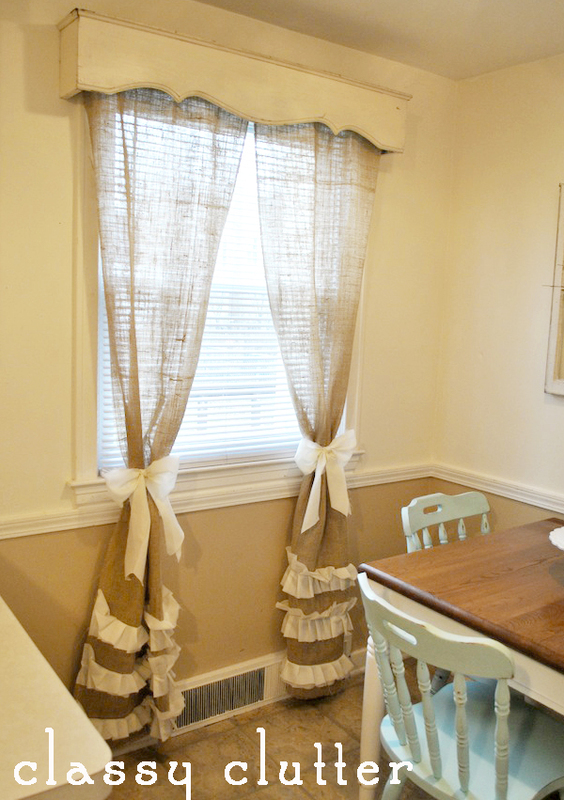 Love your dining nook curtains too … and that little clock. I’ve been eyeing one of those myself but just don’t know where I’d put it. Your kitchen turned out great! Great job! It’s amazing what a fresh coat of paint can do. The burlap curtains are super cute. The roman shade….I LOVE that fabric!! Please, please, would you ask your friend where she bought it? It’s exactly what I’ve been looking for to do the roman shades in my basement. The print & colors are perfect! Just stumbled across your blog via pinterest and am your newest follower! 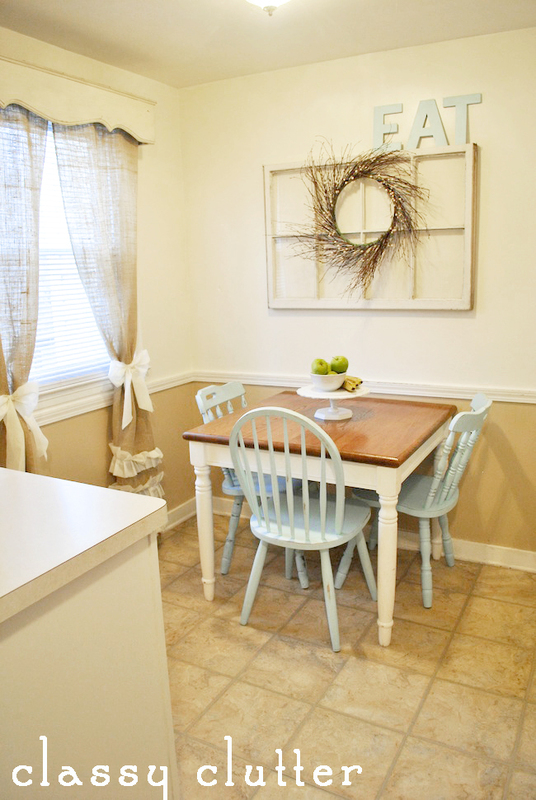 I LOVE LOVE LOVE your kitchen makeover!!! I love how you kept it so fresh and bright. Any tips on how to keep a very small kitchen from getting cluttered? Also, any reason why you did an off white/cream instead of bright white? Wow such beautiful collection of shades….This definitely will contribute to the beauty of the house. I love the white cabinets. I especially love your slightly blue chairs. Perfect!! Soooo pretty. Isn’t it amazing what a little paint can do? Im now following you. PLease come visit me at PICKINandPAINTIN.blogspot.com. Absolutely adorable kitchen! great work! Beautiful transformation. Love the roman shades. I made some with a friend – easy but so time consuming for a novice (us)! The white makes such a difference. It looks fantastic. I think the ruffled curtains are my favorite part. It is wonderful! I do think it’s a huge improvement – love your choice of white. I really like your burlap curtains too. wow! New follower. Love your style. Gosh, this is gorgeous!! That color looks amazing – it really makes your kitchen look so much bigger. Those ruffly burlap curtains are adorable! Would love it if you linked this up to my party! I love what you did. Your kitchen looks great. I have a link party called Wednesdays Adorned From Above Blog Hop and would love to have you share this with everyone. It runs from Wednesday through midnight Sunday. Here is the link to the party. huge transformation! I love the fabric on the window! Looks so much better! Brightens up the place for sure! Just something I thought of though was have you thought about putting some open floating shelves above the stove? I think it would look great! great. What a great job. I love the white! We just did the same with our kitchen cabinets, and it makes such a huge difference! It looks fabulous! Did you do anything to the counter tops? Well done – its just lovely! I wanted to mention that – and you very well already know this – but sometimes the dishwasher panel can be removed and you will find that it is white on the other side. Thought you might be interested in that fact 🙂 Thanks for sharing your kitchen’s beautiful transformation! What color and brand did you use on your walls (upper/lower) ..I really like it! Where did you get that clock? Love it! Hi Niccole! It’s from Hobby Lobby! Very pretty. I love how the soft colors brighten up the space. What is the wall color? You really had a talent in choosing the right color! Amazing! I love it! Very fresh and bright! Though the space is quiet small but you managed it very well. 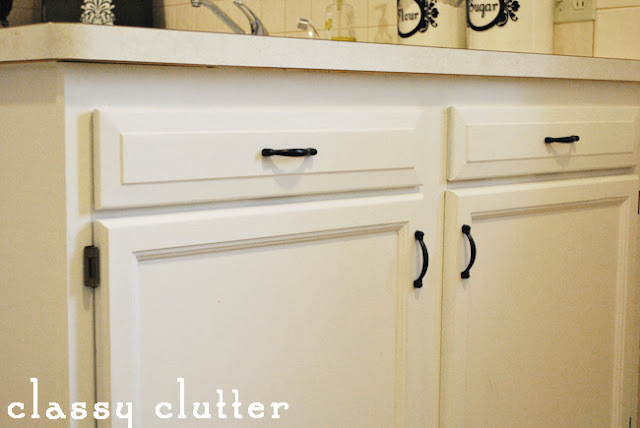 This is such an inspiration, I am thinking of repainting my cabinet in the kitchen and I wanted to be like this. Thanks. If you were to paint the cabinets today, would you use the Behr chalk paint you recently used on the round, yellow, coffee table?